Hardcover, 8.25 x 10.25 in. / 176 pgs / 84 color. This book brings together works by German-born, London-based abstractionist Markus Amm (born 1969) from the past ten years and includes an interview between Amm and Ines Goldbach, and a text by Jan Verwoert. With a focus on Amm’s abstract paintings made on chalk grounds and other surfaces, it includes installation views of various exhibitions from 2006–17. FORMAT: Hbk, 8.25 x 10.25 in. / 176 pgs / 84 color. 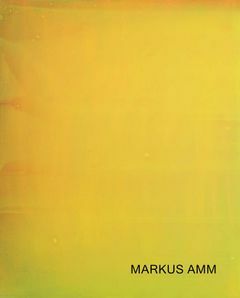 Published by Karma, New York/Kunsthaus Baselland.